Superhydrophobic surfaces have shown to be able to strongly reduce the drag experienced by a liquid ﬂowing on them with respect to ﬂat solid surfaces1 . In the last years, it was apparent that a successful strategy to obtain superhydrophobic surfaces is to combine a micro/nano-texturing with the application of a hydrophobic coating. Under appropriate conditions, the so called Cassie-state2 occurs and the liquid water does not ﬁll the surface cavities, thereby facing a composite interface consisting of both solid (the coating asperities) and air (trapped in the hollows). The aim of the present study is to investigate how water slippage is aﬀected by the surface pattern and possible liquid water penetration inside the cavities. In order to analyse the nanoscale aspect of the problem, we used a non equilibrium Molecular Dynamics approach3 , employing the state of the art of water models (T IP4P/2005) and using, for the hydrophobic coating, a realistic model of Self-Assembled-Monolayers (SAM) of Octadeciltrichlorosilane (OTS). Diﬀerent surface patterns are discussed. Slippage is estimated from the equilibrium Couette ﬂow velocity proﬁle (Fig. 1(c)) for diﬀerent liquid penetration depths (Fig. 1(a), 1(b)). 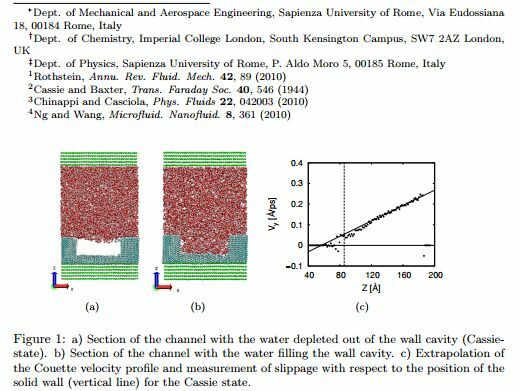 The results are compared with the slippage observed on smooth hydrophobic walls and continuum models4 . A perspective on the thermodynamic stability of the Cassie state is discussed as well.